"Neva. The Granite Sculptures. 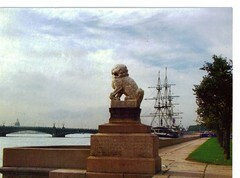 Shih Tze"
A Postcrossing postcard from Natalye in Moscow. The stamps look amazing too.